Fast forward to 2010, when now-you've-got-some-power-to-do-something-about-it Senate Majority Leader Harry Reid states in a campaign debate, "There should be a Federal Reserve audit." So it's great we've got Senator Reid standing strong against the Fed, right? With yesterday's exciting news that Audit the Fed has gained a majority of support in the U.S. House for the third Congress in a row (when so many said it couldn't be done even once), we're confident we can achieve another successful vote in that chamber, and Campaign for Liberty members' support will be instrumental in doing so. But what then? Just because Senator Reid has blocked our efforts in the past, does that mean Audit the Fed will never gets its day in the Senate? That answer depends on liberty activists. 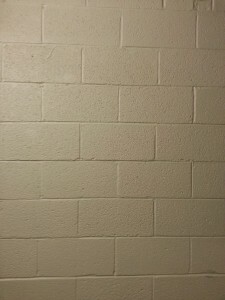 Brick walls can be intimidating. They are certainly an obstacle, but they're not impossible to overcome. Amazingly, Audit the Fed has gained the support of nearly 75% of the American people, and our movement happens to be a dedicated, committed group of activists that have already demolished many of the status quo, establishment myths about what can and can't be done in politics. Another victory in the House would go a long way toward building irresistible momentum in the Senate, but it's up to us to pour the pressure on the "upper chamber" to make a vote happen. 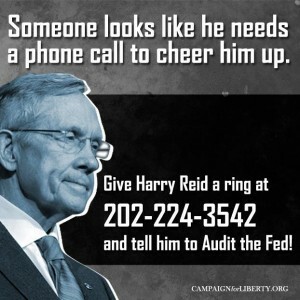 You can help increase that pressure by placing a call to the Majority Leader at the number below and urging him to stand with the American people - and his own statements - by holding a vote on Audit the Fed.